My clients tend to work hard in stressful jobs that make it hard to relax. The result is muscle stiffness, back pain and stress symptoms such as anxiety, fatigue or high blood pressure. Although I’m qualified in multiple therapeutic approaches, I’ve found Lomi Lomi massage to be the most effective at helping people ‘reboot’ themselves, ease pain and find comfort in their bodies again. This is because it’s a way of deeply listening to what your body most needs in each moment. Lomi Lomi works with your body, waiting until you are relaxed and open to work more deeply to remove muscle knots and tension. Take a look at my testimonials to see how it’s helped others. What issues can Lomi Lomi address? You will feel deeply listened to and accepted for who you are – inside and out. I’ve seen 1000s of naked bodies and heard every story under the sun. Nothing shocks me and to me, all bodies are beautiful. The massage room is a quiet sanctuary where you can be tended and restored back to good health. 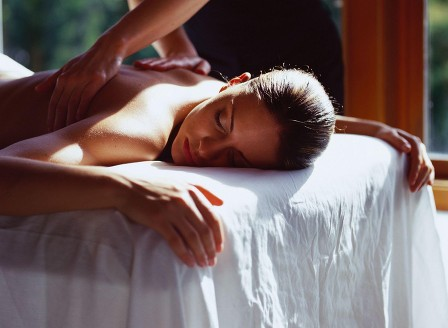 Lomi Lomi is a beautiful healing massage which is part of the culture of the Polynesians and the Healers of Hawaii. Honouring our journey through life and connecting us to spirit, our body, community and nature. Lomi Lomi seeks to reconnect you, helping you to relax fully into your body. In Hawaii, Lomi Lomi tradition has been passed down through the family and each has its own distinct style. It is a free flowing massage and often the strokes are long, gliding over the length of the body in a very relaxing, organic, wave like motion. It is guided by intuition and does not follow a set pattern so that your mind becomes quiet, unable to map the massage strokes. This helps you to relax into the movement, your body welcoming the touch and the healing energy. Lomi Lomi supports you to trust and let go of anything in your body and mind which no longer serves you. This is the most popular massage at HealingMoon and once experienced it’s difficult to go back to any other type of massage. If you need to relax then this is the perfect massage for you.